Twitter is removing Mobypicture uploads from its iOS app, are other video services to follow? Twitter is set to remove the sharing service Mobypicture from the options available for uploading video in a future release of its iOS app, The Next Web has learned. Though this is the only removal we know about currently, though it’s possible that other services like the now-defunct Posterous and others might give way to Twitter’s own video hosting option soon enough. The Mobypicture sharing option will be removed out due to a technical issue that is causing failed uploads and complaints, but the issue isn’t on the service’s end. Honestly, it is completely understandable that Twitter would want to stop any external service from affecting the ratings level or satisfaction level of its users. If a third-party service is causing problems, it’s reasonable for Twitter to want the service to get that fixed ASAP. But, in the case of Mobypicture, it’s apparently not the service causing the issues. Instead, a glitch in the way that Twitter reports types of media (mimetypes) uploaded back to the Mobypicture service is apparently causing uploads to fail, and Twitter to get complaints. The flaw in the way that video is being handed off is apparently in Twitter’s app for iPhone, not the Mobypicture service, says its founder Mathys van Abbe. He says that when Mobypicture received notice of the errors from Twitter, they investigated and uncovered the issue with the Twitter app that was causing the flaw. In an effort to circumvent the problem, Mobypicture created a fix for the media detection issue within hours of first being contacted. But even after being informed of the fix, Twitter contacted Mobypicture and reaffirmed its decision to remove it as a video sharing option and that it would think about bringing it back at a later date. We tested Mobypicture in the iPhone app today and it seemed to work just fine with a short clip, but there are obviously millions more users of Twitter around the world that could be having issues. And no video upload service currently available in the Twitter app has ever worked very well for us. 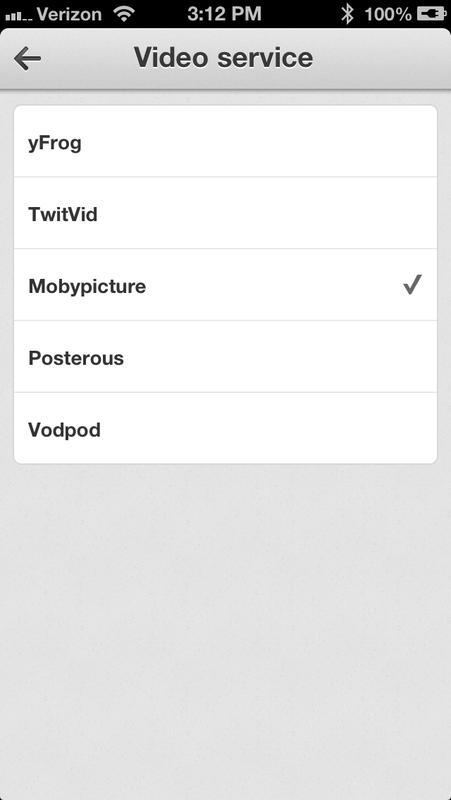 Currently, Twitter offers yFrog, TwitVid, Mobypicture, Posterous and Vodpod as options for video uploads in its iOS app. I’ve long been frustrated with all of the video services that are integrated into the Twitter app. When Twitter ditched all of the photo sharing services for its own in-house option, powered by Photobucket, I was sure that video was to follow. It turns out Twitter took a bit of a detour with the Vine purchase and now has an outside hosting service of its own (albeit for 6 second clips). Whether it eventually rolls Vine into the main Twitter product (likely a matter of how successful it is on its own) or simply fires up an internal video hosting service on its backend technology is still very much an unknown. But at this point, it feels like it’s just a matter of time. The video sharing options in Twitter for iOS are a handful of third-party services, none of which are all that reliable. I typically use Cloud or Droplr instead, if not YouTube. If Twitter were to roll its own service, it would replace all of the video sharing services, not just Mobypicture. The now-defunct Posterous is almost 100% likely to go away in the next major version of the app as well. Perhaps Twitter’s disinterest in immediately reinstating Mobypicture is an isolated incident, and perhaps it’s a precursor to an in-house option, which would remove all third-party apps. This would do a couple of things for Twitter. First, it would give them more complete control over the way that video is uploaded to the service. Taking control of image uploads with its own image service and then implementing filters in the main app ensures that there is a constant flow of content coming into its network, rather than out to other utilities like yFrog, Mobypicture or even Instagram. Second, it removes third-party failures from its list of worries. If a service like Mobypicture has issues and fails to upload a video, the user isn’t going to give the Mobypicture app one star or send a support email to Mobypicture. It’s going to complain to Twitter and Twitter will take the hit. It’s a brutal way of thinking about it but in the end, every third-party service that Twitter supports natively in its app is another potential headache. 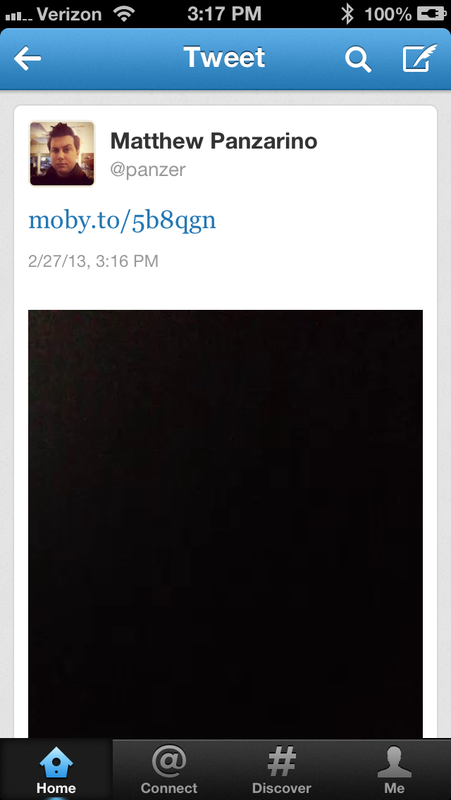 The removal of Mobypicture doesn’t prevent those users from utilizing the app on its own and tweeting out a link. But it does remove one additional potential failure point for Twitter. But, we’d be remiss if we didn’t acknowledge that it also removes one more piece of choice that is being given millions of Twitter users, most of which use the official apps.